Just a decade ago, marijuana in the popular imagination was largely associated with cheesy stoner iconography — pot leaf decals, tie-dye and paisley patterns — and its packaging was limited to discreet plastic baggies. But now, with medical marijuana legal in 23 states and recreational marijuana legal in four, top designers are stepping up to rebrand the plant. 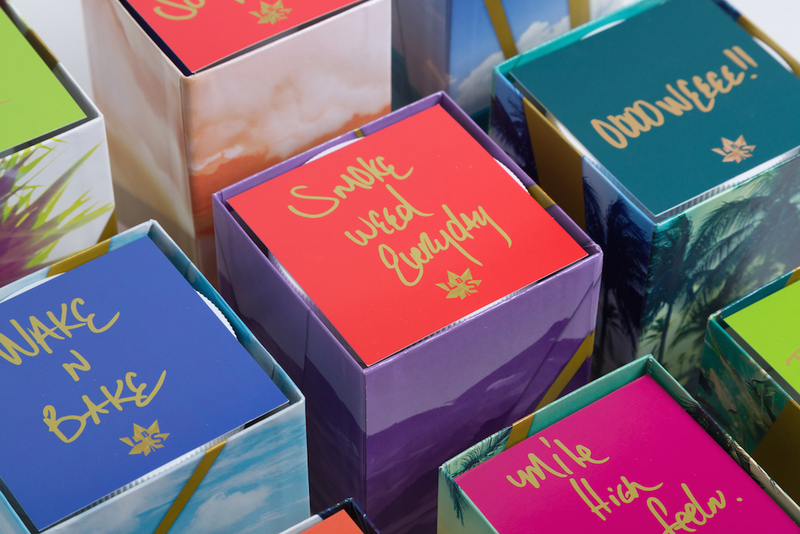 With their identity for rapper and artist Snoop Dogg’s new line of marijuana products, Leafs by Snoop (LBS), leading design firm Pentagram has given pot its highest-design makeover yet. LBS, currently only available in Colorado, consists of edibles like chocolate bars and gummies (called, naturally, Dogg Treats), plus cannabis flowers and concentrate. Pentagram partner Emily Oberman created colorful, elegant packaging that would fit right in at any mainstream health food store. It makes a once-illicit substance look downright wholesome — how could such a cute box of cherry gummies possibly land you in jail? Pentagram, the design powerhouse behind identities for Tiffany’s and Saks Fifth Avenue, among other luxury companies, caters to a demographic broader than your stereotypical Harolds and Kumars. The identity targets the connoisseurs of the weed world — “alpha stoners,” like Snoop Dogg, and “stiletto stoners,” as marijuana branding expert Cheryl Shuman calls female smokers with office jobs.